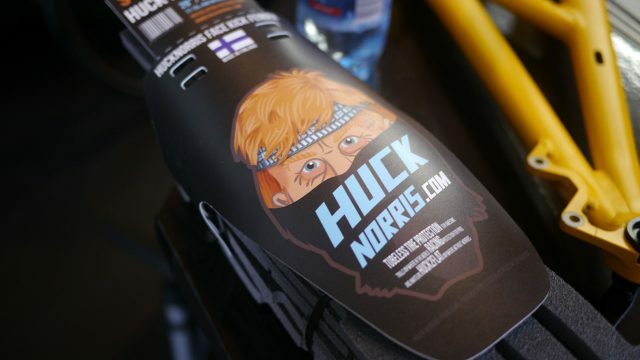 One of the stranger things we’ve seen so far at Eurobike is Huck Norris. They say it fights off Bruce Leaks. 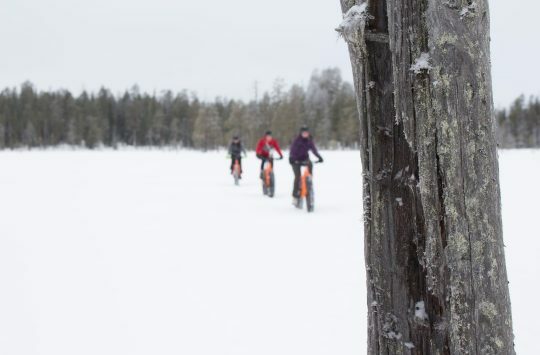 Hailing from Finland, it’s a type of foam tubeless puncture protection that they’ve tested extensively racing rocky tech. They’ve given us a set to test, which will be going to David thanks to his substantial reputation for smashing wheels into waterbars. We hope no one chucks any lawyers at them. Below is how it fits. 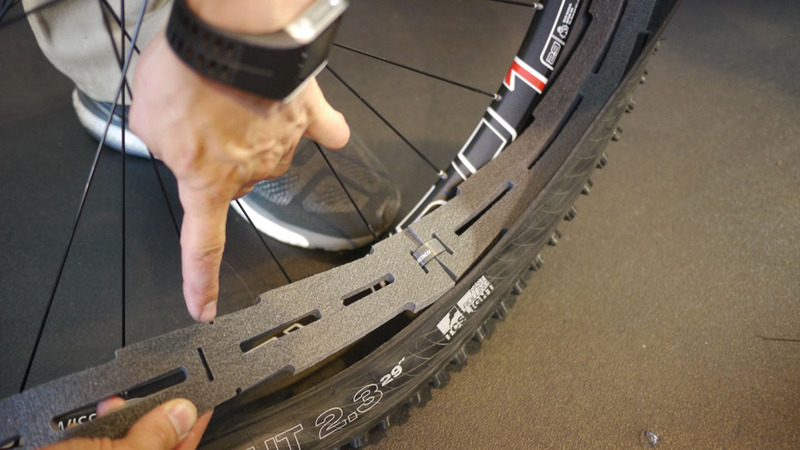 Astoundingly, it also makes it much easier to seal tubeless tyres. Where he’s pointing is the mark to trim down to 27.5″ size. You can keep trimming down to 26″ too, and the ends secure with the velcro you can see. “It’s not the same foam as a camping mat” they volunteered, and indeed on closer inspection it isn’t. It’s a closed cell foam and slightly denser. I asked how many types of foam they’d tried in prototypes, and they said five different industrial foams before they found the right balance of weight and resilience. 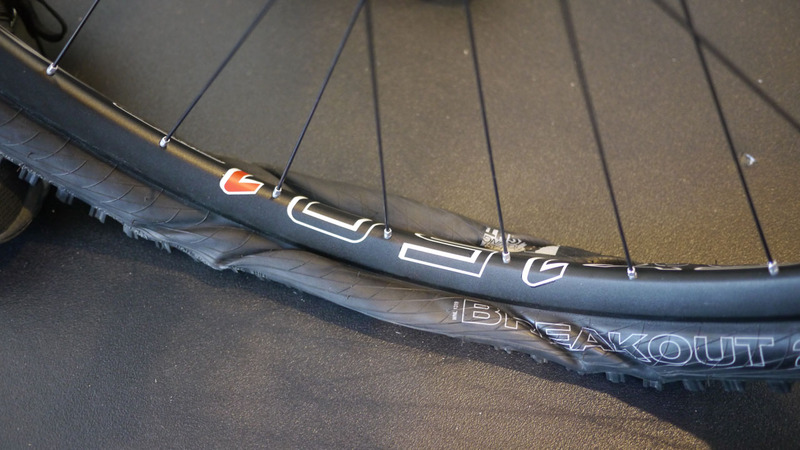 At just 70 – 77g per wheel, it’s also a lot lighter than the other puncture protection systems out there. The foam sits inside the tyre like this. 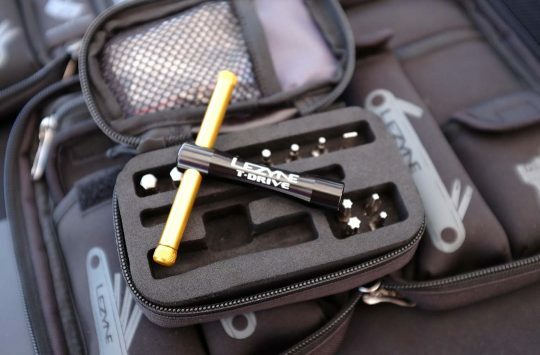 Unlike more complicated setups like Procore and Deaneasy, it’s just one piece of foam that goes in your tyre and doesn’t need to sit tight down to the rim bed. It actually floats a few centimetres above the rim, in the middle of the tyre. 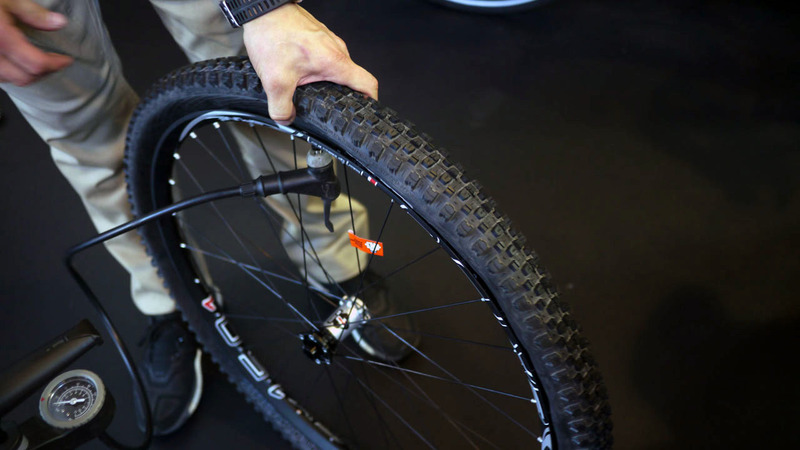 Once inside, Huck Norris forms a kind of foam skeleton in the middle of the tyre carcass. They challenged me to fail at using a track pump to mount a tyre with it in. There was no sealant and no lube on the beads, but thanks to it reducing the total air volume slightly, and giving the tyre a bit of shape when deflated, to my surprise it went straight up and onto the beads. Sure, it’ll leak without any sealant in, but short of using a compressor this was the easiest time I’ve ever had getting a tyre to seal. The show halls are boiling hot and I didn’t get even slightly sweaty! In the event of an impact that would normally damage a rim or cut a tyre, the high density foam decelerates both enough to prevent most damage. Once inflated, it also made a whizzing sound as it rotated inside the tyre. I suspect that will be less pronounced when sealant’s in there, and apparently on the bike you’ll only hear the whizz under hard braking. It remains to be seen how Huck Norris will withstand the rocks of Calderdale, but it’s off to a promising start. 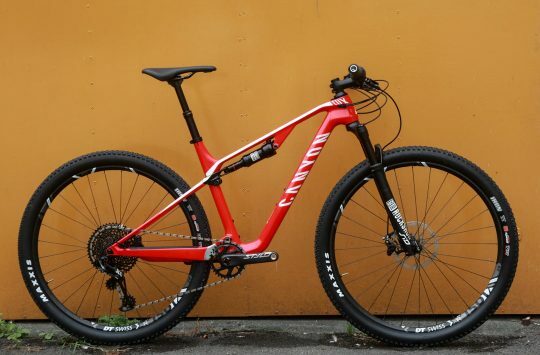 We’ll let you know as we test it for the next few months. Issue 108 - Pre-order Now! Does the foam not soak up a huge amount of sealent? No, because it’s closed cell rather than open cell foam, meaning it doesn’t act like a sponge or have any fluid paths going right the way through. The surface will absorb a little extra sealant, but not much. 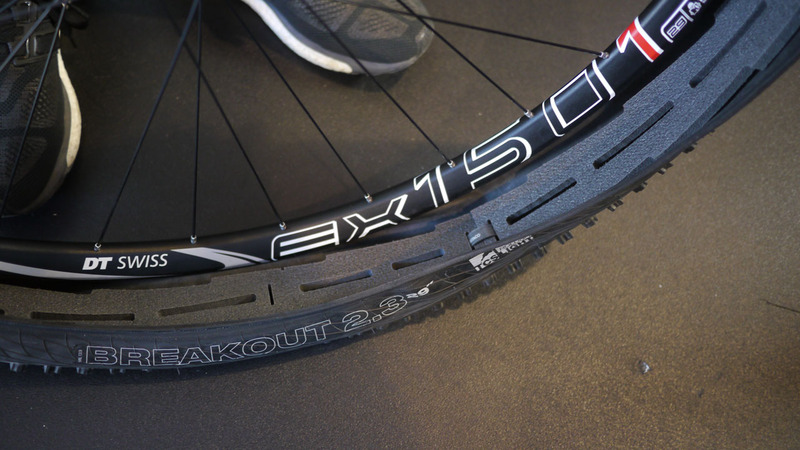 Reducing air volume for seating tubeless I can understand, but how does it act as puncture protection? @deadkenny: The foam is dense enough that, when an impact forces the tyre and rim toward each other, the foam squashes between them, decelerating both and reducing the forces exerted on them. They’re saying it is a consumable product, as each time this happens the rim tends to make a short cut in the foam, but one set lasted Leo from Pole bikes a season of racing. I’m also guessing that if you run low pressures you could still burp a tyre, as unlike Procore or Deaneasy it doesn’t lock the beads in place from behind. Huck Norris is less than half the weight of Procore though, and less complicated to set up or tinker with. Looks like the packaging works as a race-guard type fender too. Nice!